The citizens of Edmonton are eagerly writing, telling and taping their stories online, to tell the world all about their city. The program launched on May 14th and already there are over 90 stories about living in, working in and visiting Edmonton on the website. "The response has been great, but we know there are more stories to be told, says Mary Pat Barry, Branch Manager of Corporate Communications for the City of Edmonton. "We want to know about the particular moment or event that made it all come together for someone in terms of what is special about Edmonton for them. It's a personal story of what our city has made possible from the perspective of someone who lives here or who has visited." 1. Prepare your Edmonton story. 2. 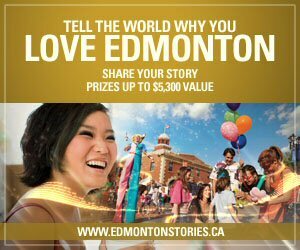 Go to edmontonstories.ca and submit your story in written, audio or video form. Share your stories about what makes Edmonton special to you. Your stories can be about anything - the moment you first saw the fireworks on Canada day, the great adventures you have with your friends, the best things to do in Edmonton or the kindness of a stranger. 3. Don't be shy, be bold! Every story has a chance to win! Grand prizes will be chosen by popular vote. You could also win 1 of 2 iPod touches or 1 of 3 iPod shuffles just for entering your story or for voting for your favourite story. Draw dates throughout the summer. Stories need to be submitted by 11:59:59 a.m. MST Friday, July 31, 2009 to take part in the contest. A voting period will follow the contest entry close. For more ideas and tips on writing your story go to edmontonstories.ca. Image: Visit www.edmontonstories.ca to see the amazing entries already submitted. Then enter for your chance to win!